LYCOPENE 101: HOW WATERMELON CAN HELP YOU GET MORE OUT OF THIS POWERFUL ANTIOXIDANT - What About Watermelon? If you want to stay healthy and feel your best (and who doesn’t? 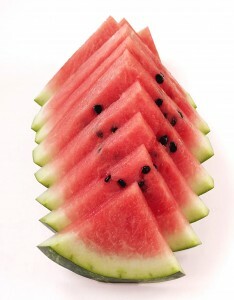 ), you might want to include more lycopene-rich foods — like watermelon — in your daily diet. Lycopene is one of hundreds of carotenoids in fruits and vegetables (beta carotene is the most well-known). Lycopene is the pigment that makes many fruits and veggies a rich and vibrant red. While tomatoes have gotten the most press when it comes to their lycopene content, you might be surprised to hear that watermelon is also a source of lycopene, with 15 to 20 milligrams for every two-cup serving. Adopting a diet rich in colorful fruits and vegetables is one of the best things a person can do to stay healthy, maintain a healthy weight, and lower disease risk. Adding lycopene-rich foods, like watermelon, to that mix is one way to reach that goal. Granted, lycopene cannot be converted to vitamin A like its cousin beta carotene, but it is a powerful antioxidant. This is just one of the reasons why it has been studied to identify its role in health promotion and disease prevention. How Much Lycopene Do You Need? Like all of the carotenoids in foods, the jury is still out on the exact amount of lycopene you need for health and possible disease prevention. What is known is that because this antioxidant-rich compound is fat-soluble, you can greatly improve its absorption by adding a little fat to any meal that contains a lycopene-rich fruit or vegetable. For example, one study found that adding avocado to salsa boosts lycopene absorption more than four-fold! One thing is for sure: You can’t go wrong by adding colorful produce, like watermelon, to your diet. The results are good for your health today and tomorrow!